Earlier this month, USDA updated the maps that determine if homes are eligible for USDA financing. USDA allows eligible home buyers to purchase a home with no down payment. In order the qualify, the borrowers must meet the income limit requirements and the property needs to be in a designated rural area. EDITORS NOTE June 5, 2017: Of course USDA income limits were updated right after I published this post! Please click here for 2017 income limits for USDA mortgages in Washington state. Effective October 1, 2016, the upfront guarantee fee and annual fee (paid monthly) will be reduced with USDA mortgages. This new fee structure will take place until September 30, 2017, the end of the fiscal year for USDA. On October 1, 2015 the upfront guarantee fee for purchase and refinance loans will increase from 2 percent to 2.75 percent. The annual fee will remain at 0.50 percent for purchase and refinance loans. This change is necessary to maintain the program’s operational cost structure, which requires no congressional subsidy support to offset credit costs. USDA Income Limits – Updated! USDA has released new income limits effective April 1, 2015. USDA offers a no-down payment mortgage program which is available in rural areas (typically a town with population of 10,000 or less). USDA does not have loan limits, the program is limited by household income and if the property is in a USDA designated location. USDA offers mortgages with no down payment for homes that are located in designated rural areas to borrowers who meet household income limits. The mortgage rates are very competitive and the mortgage insurance (technically called “guarantee fees”) are very affordable. It’s truly a great program for those who qualify and are buying a home in rural areas, like Duvall, Enumclaw or Anacortes. USDA has published updated income limits for their zero down mortgage program which is available in rural areas. Other mortgage programs, like FHA or conventional, has loan limits which limits availability. USDA does not have loan limits, the program is restricted by household income. USDA offers a government backed program that allows zero down payment on homes that are in a designated rural community for families earning less than a certain income. 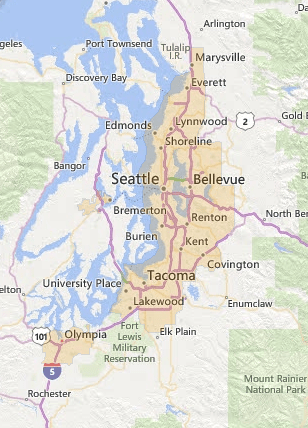 A majority of Washington State single family residences (homes and condos) qualify…of course if you live in metropolitan areas like Seattle or Bellevue, odds are your home will not. However, if you’re considering areas like Duvall, parts of Maple Valley, Vashon or Bainbridge Island, it may qualify for zero down financing.